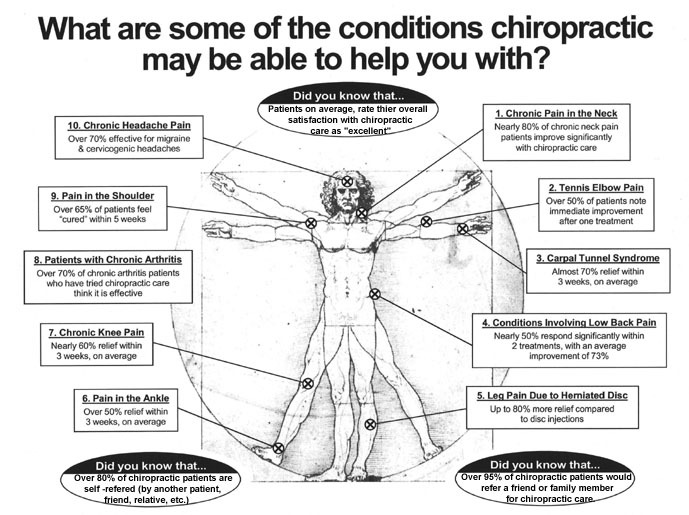 Keyes to Health - Chiropractor in Pickering; ON; Canada :: What are some of the conditions chiropractic may be able to help you with? While Chiropractic care has been shown to correct mechanical low back pain and is in fact better than any other combined or individual form of treatment, Chiropractors take care of a lot more than back pain. Read on and find out how Chiropractic can help you. Recently, we received a phone call from a patient who was calling to cancel her appointment. At the time, she had been receiving chiropractic care for her chronic migraine headaches, with excellent results, I might add. When asked why she was cancelling, she responded that just that afternoon she had strained her neck and had to go to the doctor. At that point, I was called to the phone to speak with her about her neck pain. After some questioning about the pain to make sure that it was not catastrophic, I asked her why she was not coming in so that I could treat her neck pain? She answered, "I thought you only treated the bones. This is a muscle problem!" From that point forward, I made it my plan to let everyone know when to visit the Chiropractor. So in case I have forgotten to inform you, here is a list of the kinds of musculoskeletal problems Chiropractors can help you with. Neck pain, whether you sprained or strained it at home, in a car accident or at work. Back pain, that is upper, middle or lower back pain. Pain in your joints, such as shoulder, elbow, knee, wrist, hip, ankle, feet or hands. You do not need a prescription from your family doctor for most of the health services at Keyes To Health, including for accident coverage or workers comp. If you have a pain complaint that is not on the list, or if you have pain and have been wondering what to do about it, please contact the clinic by phone or email and we will let you know if it something we can help you with. Also, feel free to pass this newsletter on to your friends, neighbours, collegues and family members, as they may be looking for relief from pain too. The Staff and Therapists at Keyes To Health are committed to providing you with the most comprehensive professional care and courteous treatment for your health complaints.